The production of wound odour can represent a major problem for patients and their carers. If the formation of the odour cannot be prevented, it may be necessary to use a dressing that adsorbs the volatile molecules released from the wound which are responsible for the smell. The performance of four dressings each containing activated charcoal designed to be used in the treatment of malodorous wounds have been assessed in a laboratory-based study. The results of this investigation suggest that differences exist in the performance of these products that may have potentially important clinical implications. It is well recognised that certain types of wounds produce noxious odours which, even in moderate cases, can cause significant distress or embarrassment to a patient and their relatives. In extreme cases this odour can become so overpowering that it may cause an individual to withdraw from social contacts, even with family and close friends. Despite these problems, odour absorbing dressings are currently not included in the list of reimbursable dressings in the United Kingdom and are therefore not available on prescription. Wounds most commonly associated with odour production include leg ulcers and fungating (cancerous) lesions of all types. The smell from these wounds is caused by a cocktail of volatile agents that includes short chain organic acids, (n-butyric, n-valeric, n-caproic, n-haptanoic and n-caprylic) produced by anaerobic bacteria,  together with a mixture of amines and diamines such as cadaverine and putrescine that are produced by the metabolic processes of other proteolytic bacteria. Less conventional methods of treating malodorous wounds include the the use of honey,  some varieties of which contain potent antimicrobial agents, and sugar,  either alone or in the form of a paste. The hyperosmotic environment produced by high concentrations of sugar is believed to inhibit bacterial growth,  and thus prevent odour formation. Live yoghurt is also sometimes applied in an attempt to encourage overgrowth of pathogenic organisms by lactic acid bacteria such as Lactobacillus bulgaricus and Streptococcus thermophilus. If for some reason, however, it is not possible to eliminate the bacteria responsible for the production of the odour it may be possible to deal with the problem by some other means. Historically wound odours were masked by burning incense and in more recent times, by the use of aerosols or air fresheners. Obviously although these do not resolve the underlying problem, they may make life a little more bearable for the patient and their family! In 1976, a more scientific approach to the control of odour was reported by Butcher et al.,  who described the use of a charcoal cloth developed by the Chemical Defence Establishment, Porton Down. 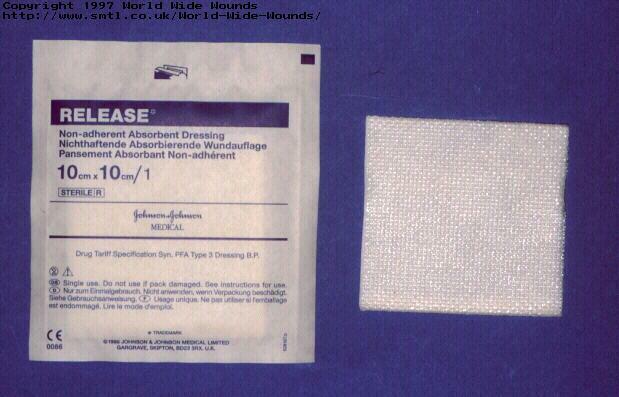 This material was incorporated into pads containing surgical gauze and a layer of a water repellent fabric. When these pads were used in the treatment of fungating breast cancer, gangrene and immediate post operative colostomies, the associated odours were said to be totally suppressed. Activated charcoal cloth is produced by carbonising a suitable cellulose fabric by heating it under carefully controlled conditions. During this process, the surface of the carbon breaks down to form small pores. These greatly increase the effective surface area of the fibres and hence their ability to remove unpleasant smells, as it is believed that the molecules that are responsible for the production of the odour are attracted to the surface of the carbon and are held there (adsorbed) by electrical forces. In the main these molecules are small and detected by the nose in low concentrations in the air. A single dressing which, by virtue of the large surface area of the carbon, is capable of taking up very large numbers of molecules should therefore prove capable of removing odour over prolonged periods. Since 1976, a number of odour controlling dressings containing activated charcoal have been produced commercially. The first of these was Actisorb (Johnson & Johnson). In laboratory studies it was found that if the dressing was shaken with a suspension of bacteria, the organisms became firmly attached to the charcoal fabric and thus removed from the solution, although they still remained viable. A modified version of this dressing was therefore developed (Actisorb Plus) which contains 0.15% silver chemically bound onto the carbon. This imparts pronounced antibacterial activity to the dressing, killing the bacteria which are bound on to the cloth. Since the introduction of Actisorb Plus, a number of dressings containing activated charcoal have been developed. Some of these, like Actisorb itself, are intended to be placed in direct contact with the wound. These products vary in structure and composition and hence in their ability to cope with wound exudate - often an important feature of malodorous wounds. Other products are designed as secondary dressings which are placed over a primary dressing, but beneath the retaining dressing or bandage. Examples include Clinisorb (Clinimed) and Denidor (Jeffreys, Miller & Co). Despite the relatively widespread use of odour absorbing dressings, however, little objective comparative data is available on their odour and fluid handling characteristics. A number of possible test systems have been described for the odour absorbing properties    but two of these only considered the efficacy of the dressing in the dry state. The fluid handling properties of odour adsorbing dressings were considered in a separate study. This may be important because the presence of liquids particularly those containing organic solutes, may have implications for the performance of the activated charcoal, competing for active sites with the molecules responsible for the odour and thus reducing its effectiveness. Previous workers have used both chemical    and biological materials   to test the efficacy of odour adsorbing dressings. The former technique is often favoured as the efficiency of the dressing can be determined using standard analytical techniques such as gas liquid chromatography. Determination of dressing performance using biological materials is currently restricted to more subjective methods of assessment such as the use of a human test panel. Lawrence et al,  adopted this second approach when they compared the odour absorbing properties of five dressings containing activated charcoal with that of a cotton gauze swab, acting as a control. A panel of volunteers were asked to assess the odour liberated from test samples after the addition of cultures of bacteria isolated from malodorous wounds. A similar approach was adopted by Griffiths et al., who also used microbiologically derived odours to test the performance of a range of products. The aim of the current study was to develop a more objective test system that could be used to compare the ability of different dressings to prevent the passage of a volatile amine when applied to a wound model under simulated `in-use' conditions. Actisorb Plus, Johnson & Johnson Medical Ltd, comprises a charcoal cloth consisting of 95-98% carbon, produced by carbonising and activating a knitted viscose rayon fabric. The rayon fabric is enclosed in a sleeve of spun-bonded non-woven nylon, sealed along all four edges, to facilitate handling of the dressing and to reduce particle and fibre loss. Figure 2 - Actisorb Plus dressing cut open to show structure. CarboFlex, ConvaTec Ltd, is a multi-component dressing that consists of a wound contact layer composed of alginate and carboxymethylcellulose fibres, bonded to a plastic film that that has perforations designed to facilitate the passage of liquid in one direction only. 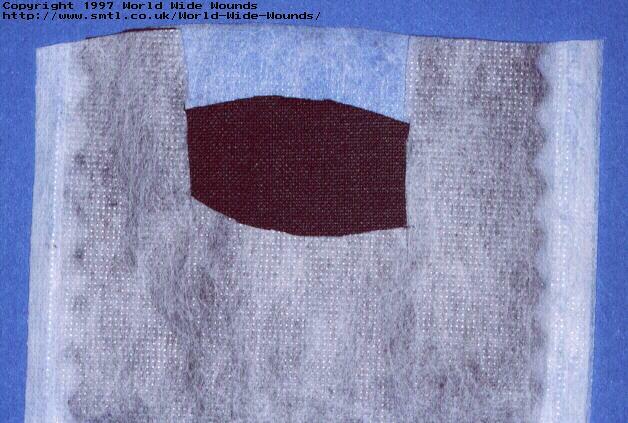 Immediately behind this film is a piece of charcoal cloth and an absorbing layer of mixed fibres. 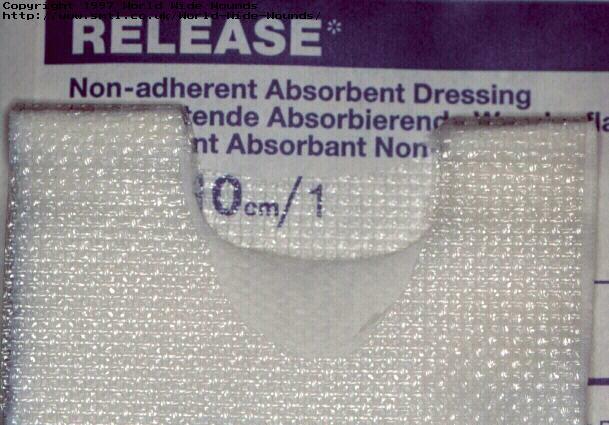 A second perforated plastic layer, sealed around the perimeter to the first, completes the structure of the dressing. 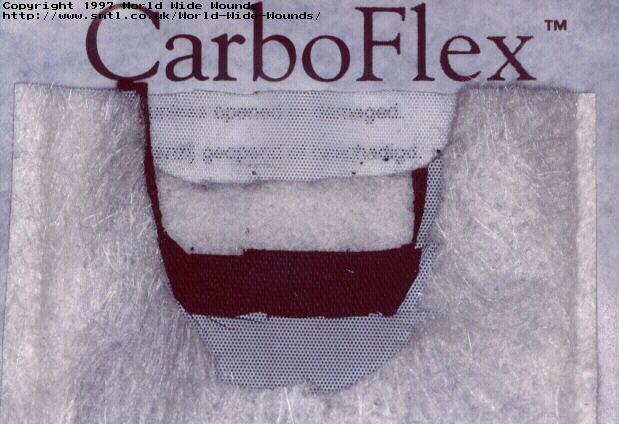 Figure 4 - CarboFlex dressing cut open to show structure. 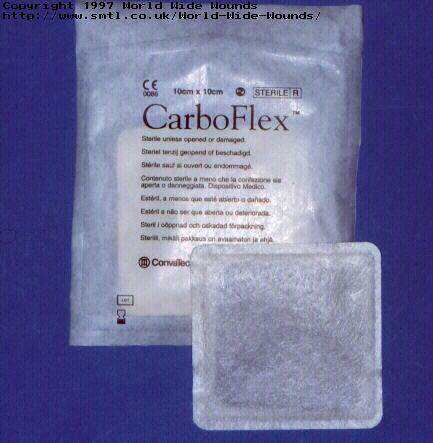 Carboflex may be placed directly on the surface of the wound and held in place with tape or a bandage as appropriate. Carbonet, Smith & Nephew Medical is also a multi-component dressing that combines both fluid and odour absorbing properties. It consists of a low adherent wound contact layer of knitted viscose backed with an absorbent layer of fibrous cellulose to which is bonded a layer of activated charcoal cloth sandwiched between two layers of polyethylene net. An outer layer of polyester fleece completes the structure of the dressing. Figure 6 - Carbonet dressing cut open to show structure. 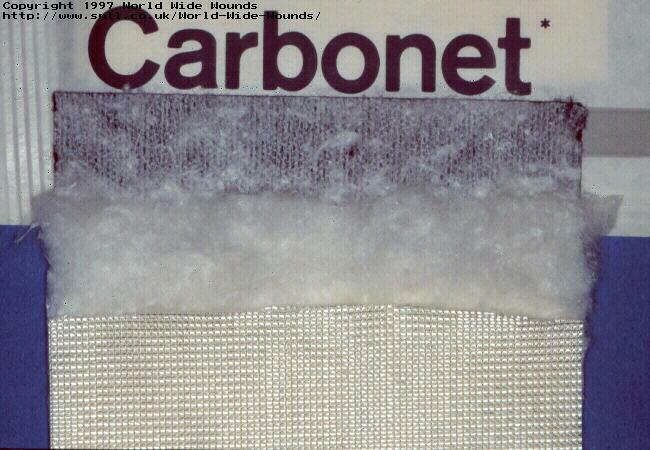 Carbonet may be placed directly on the surface of the wound and held in place with tape or a bandage as appropriate. 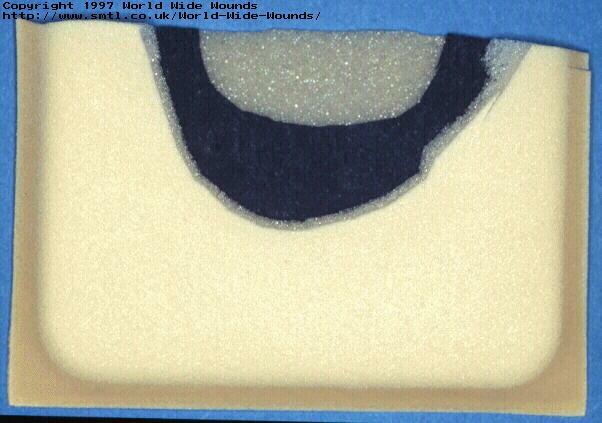 Figure 7 - Lyofoam C.
Lyofoam C, Seton Healthcare, consists of two pieces of polyurethane foam bonded together around the perimeter, enclosing a layer of a non-woven fabric that is impregnated with activated carbon granules. Figure 8 - Lyofoam C cut open to show structure. 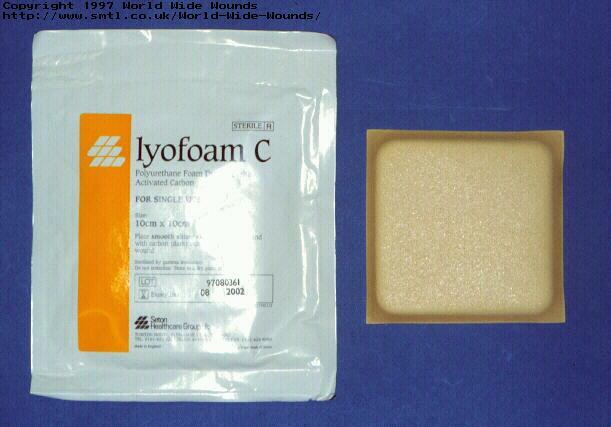 Lyofoam C may be applied directly to the wound and held in place with tape or a bandage as appropriate. 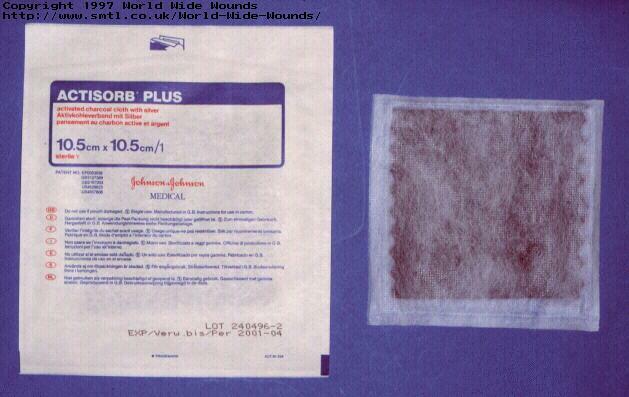 Release, Johnson and Johnson Medical, consists of an absorbent fibrous core covered with a sleeve of perforated plastic film. Figure 10 - Release dressing cut open to show structure. It contains no activated charcoal and as such would not be expected to adsorb odour. This apparatus consists of a stainless steel plate bearing a central recess 50 mm diameter about 3 mm deep into which is inset a removable perforated stainless steel disc and a disposable Millipore pre-filter. 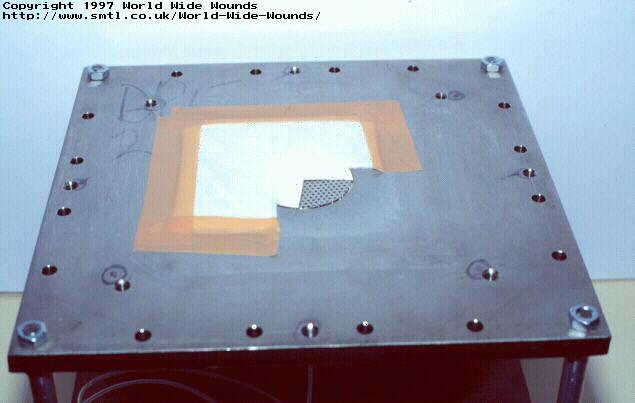 Fitted to the stainless steel plate is an airtight perspex chamber with inlet and outlet ports. 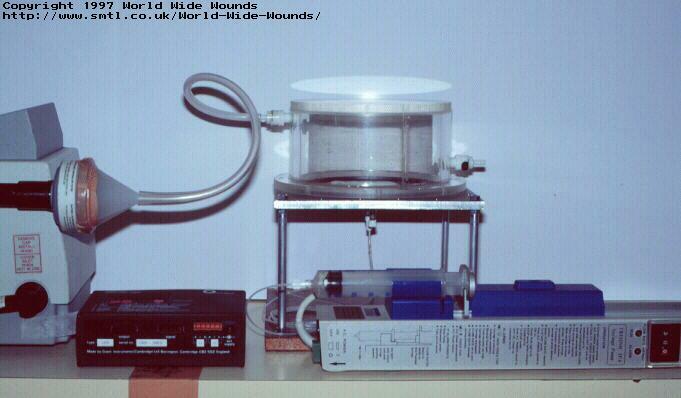 Figure 11 - Test apparatus showing dressing in place. The dressing under examination is placed over the recess and sealed around the edges with impermeable plastic adhesive tape (Sleek - Smith and Nephew). The test solution consists of sodium/calcium chloride containing 142 millimoles of sodium ions and 2.5 millimoles of calcium ions (values typical of those found in serum or wound exudate), to which is added 2% diethylamine and 10% newborn bovine serum (Flow Laboratories B/N 0030342). This test solution is applied to the dressing through the perforated plate at a rate of 30ml/hour by means of a Vickers IP4 syringe pump (Vickers Medical, Sidcup). The concentration of diethylamine in the air in the perspex chamber is constantly monitored using a Miran 1B2 portable ambient analyser (Quantitech Ltd, Milton Keynes) and the measured values recorded electronically using a datalogger. Figure 12 - Complete testing rig. The test is continued until the concentration of diethylamine present in the air above the dressing has risen to approximately 15 ppm. Five different dressings containing activated charcoal were tested by this method together with a low-adherent absorbent dressing to act as a control. The time taken for the concentration of diethylamine to increase by 10 ppm above baseline values was obtained from each dataset. From this value and the flow rate of syringe pump, the volume of fluid that had been applied to each dressing was calculated. The individual results for each sample of dressing together with the mean and standard deviation are shown in Table 1. Table 1: Total volume of test solution applied to dressings to produce 10 ppm of diethylamine in the air drawn through the test chamber. Figure 13 - Change in concentration of diethylamine over time. The results of this study demonstrate clear differences in the ability of the products to contain the test solution and prevent the loss of the volatile diethylamine into the surrounding air. 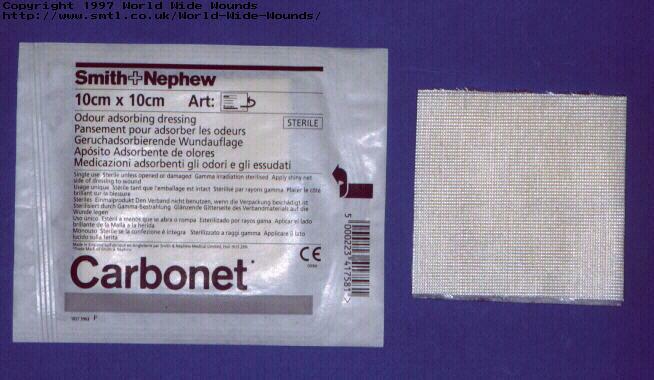 Release, an absorbent dressing which contains no activated charcoal, is able to delay the passage of the diethylamine through the dressing but is less effective in this regard than Actisorb Plus which has limited absorbency. This suggests that the odour absorbing properties of the dressing are determined by at least two factors, the physical absorbency - a function of the presence of some form of absorbent layer, and the activity of the charcoal cloth itself. Products which combine a physical absorbent with a charcoal component show enhanced performance as might be anticipated. What is not clear from the results, however, is whether the odour absorbing component of a dressing is likely to be most effective when applied directly to the surface of a wound or when it is incorporated into the structure of the pad or used as a secondary dressing. Further work is required to determine if the performance of the product is impaired once the dressing is saturated with wound fluid. A previous study has shown that leg ulcers exudate at the rate of about 0.5 ml/cm2/24 hours. A wound with an area of 10 cm2 could therefore be expected to produce about 5 ml of exudate in 24 hours. Based upon the results of the present study, therefore, the dressings examined could be expected to provide a degree of odour control varying from about 12 hours to three days. It is important to note, however, that the rate at which the test solution was applied during these tests was 30 ml per hour (36.7 ml/cm2/24 hours) and this value is considerably in excess of that encountered clinically. It could be argued, therefore, that this may have some effect upon the absolute performance of the dressings although it is considered unlikely that it would have a major effect upon the ranking order of the products as all these tests are comparative. Further investigations are planned to test the effect of flow rate on odour control. A second possible criticism is the choice of diethylamine as the test material as this is not an agent normally found in wound exudate although it has a formula weight (FW) of 73, comparable with that of cadaverine, (H2N (CH2)5 NH2, (FW 102)) and putrescine, (H2N (CH2)4 NH2 (FW88)) molecules with which it shares some chemical similarities. Diethylamine has also been used on a number of occasions previously for assessing the performance of charcoal dressings. The use of an alternative test solution such as a bacterial culture was considered prior to commencing this work, but was discounted because no objective system was available to us that could be used to measure odour production from such a complex mixture. Despite these potential criticisms, however, it is proposed that the technique described does provide, possibly for the first time, an objective method for comparing the performance of different odour absorbing dressings when challenged with a test solution containing an odiferous volatile amine under simulated conditions of use. Van Toller S. "Psychological consequences arising from the malodours produced by skin ulcers", Proceedings of 2nd European Conference on Advances in Wound Management, Harrogate 1992, Macmillan Magazines Ltd, Ed. Harding K.G. , Cherry G. , Dealy C. , Turner T. 1993, 70-71 . Moss C.W. , Dees S.B. , Guerrant G.O. "Gas Chromatography of bacterial fatty acids with a fused silica capillary column", J.Clin Microbiol, 1974, 28, 80-85 . Parry A.D. , Chadwick P.R. , Simon D. , et al " Leg ulcer odour detection identifies beta-haemolytic streptoccal infection", Journal of Wound Care, 1995, 4, 404-405 . Brennan S.S. , Foster M.E. , Leaper D.J. " Antiseptic toxicity in wounds healing by secondary intention", J.Hosp.Infect, 1986, 8, 263-267 . Brennan S.S. , Leaper D.J. " The effect of antiseptics on the healing wound:a study using the rabbit ear chamber", Br.J.Surg, 1985, 72, 780-782 . Thomas S. , Hay N.P. "The antimicrobial properties of two metronidazole medicated dressings used to treat malodorous wounds", Pharm.J., 1991, 246, 264-266 . Hampson J.P. " The use of metronidazole in the treatment of malodorous wounds", Journal of Wound Care, 1996, 5(9), 421-425 . Keast-Butler J. " Honey for necrotic malignant breast ulcers", Lancet, 1980, ii, 809 . Thomlinson R.H. " Kitchen remedy for necrotic malignant breast ulcers", Lancet, 1980, ii, 594 . Chirife J. " In-vitro study of bacterial growth inhibition in concentrated sugar solutions: microbiological basis for the use of sugar in treating infected wounds", Antimicrob.Ag Chemother., 1983, 23, 766-773 . Thomas S. , Jones M. , Shutler S. , Jones S. " Using larvae in modern wound management", Journal of Wound Care, 1996, 5(1), 60-69 . Evans H. " A treatment of last resort", Nursing Times, 1997, 9(23), 62-67 . Butcher G. , Butcher J.A. , Maggs F.A.P. "The treatment of malodorous wounds", Nursing. Mirror , 1976, 142, 76 . Schmidt R.J. , Shrestha T. , Turner T.D. " An assay procedure to compare sorptive capacities of activated carbon dressings: the detection of impregnation with silver", J.Pharm. Pharmacol, 1988, 40, 662-664 . Shaw R.J. , Maher G.A. "A test method for quantifying absorbtive capacities of intact charcoal-containing wound management products", . Griffiths B. , Jacques E.J. , Jones S.A. , et al "Determination of malodour reduction performance in various charcoal containing dressings. ", Proceedings of 7th European Conference on Advances in Wound Management, Harrogate 1997, 1997, . Griffiths B. , Jacques E.J. , Waring M.J. , Bowler P. , Bishop S. "Investigations into the fluid handling characteristics of various charcoal containing dressings", Proceedings of 7th European Conference on Advances in Wound Management, Harrogate 1997, 1997, . Myles V.M. , Griffiths B. , Bishop S. "An investigation into the selective adsorption of malodour molecules onto charcoal containing dressings", Proceedings of 7th European Conference on Advances in Wound Management, Harrogate 1997, 1997, . Lawrence C. , Lilly H.A. , Kidson A. "Malodour and dressings containing active charcoal", Proceedings of 2nd European Conference on Advances in Wound Management, Harrogate 1992, Macmillan magazines Ltd, Ed. Harding K.G. , Cherry G. , Dealy C. , Turner T. 1993, 70-71 . Mulligan C.M. , Bragg A.J. , O'Toole O.B. " A controlled comparative trial of Actisorb activated charcoal cloth dressing in the community", Br.J.Clin.Pract, 1986, 9(1), 145-148 . Thomas S. , Fear M. , Humphreys J. , Disley L. , Waring M.J. "The effect of dressings on the production of exudate from venous leg ulcers", Wounds, 1996, 8(5), 145-149 .